ーPlease tell us the reason why you got into your job at Ichizawa Shinzaburo Hanpu. I have an unique background. Before coming to this company, I was work at some restaurants. I hoped to open my own restaurant someday, but I damaged my health. Then, my friend introduced me this company as my new workplace. I originally liked to make something, and I am good at it, too. That’s why I decided to work for this company. Although I have worked for 32 years, I had never sewn something until I started to work here. 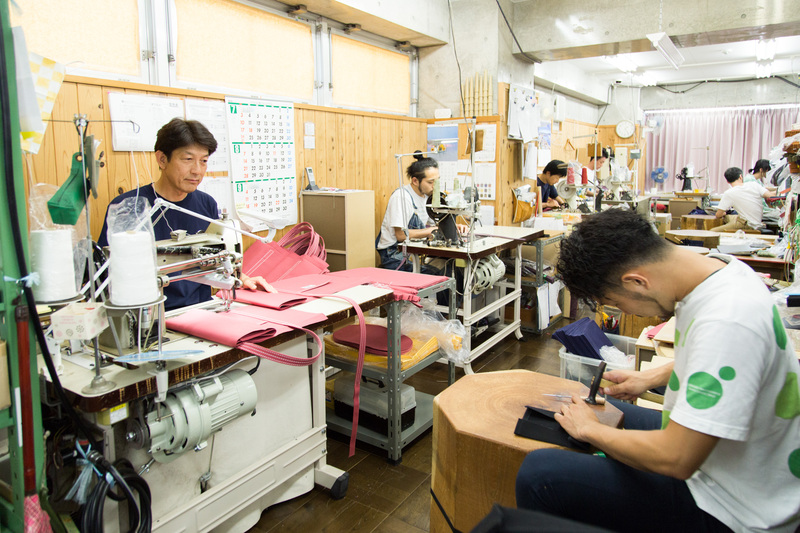 Only after entering this workplace, I first experienced making something from flat fabrics. Like me, there are actually many workers who joined us as totally beginners. ーI see. How did you learn the skill in the beginning? Although we have about 80 artisans now, there were only about 10 workers when I started to work here. At that time, female workers made bags, and men often made tents for the edge of the eaves. I followed my seniors to go to their customer’s houses. 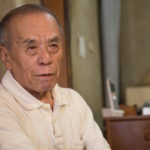 I learned techniques through helping seniors there. They sometimes taught me how to sew, too. They were always strict about work. They checked my products all the time, and advised me. Although they were quite strict, I didn’t give up. I guess that’s because I really wanted to learn more and make better things. 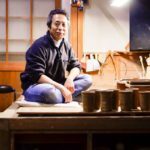 ーHow do you make products? We are often divided into a pair to make products. 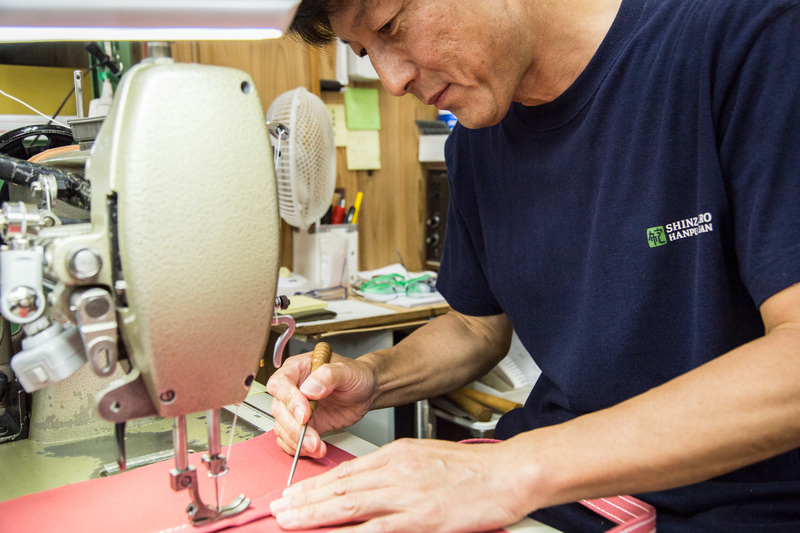 An experienced staff who uses a sewing machine and another staff called shita-shoku who add marks and metal fittings on the bag. From cutting fabrics to completing the bag, the pair do by themselves. In fact, we don’t have any operating manual. We do have the image of finished product, but we don’t order staffs how to make it. Working style differs among workers; some workers sew pockets first and other workers do that later. We don’t care about the difference as long as they create products of high quality. We don’t change size or shape as we like, but each worker makes product by figuring out the right way for himself. 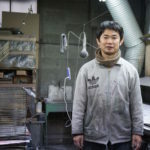 ーMost workshops adopt the division of labor, but at your shop, people make products by dividing into a pair. This style is not usual, I suppose. If we emphasis on efficiency, adopting the assembly line work style may be the better option. However, we want artisans to acquire overall skills, and I believe they should make by themselves from start to finish. 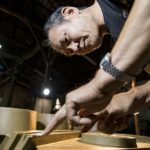 Because of this reason, we rather choose this pair-working style, considering that brushing up artisan’s technique is quite important. Moreover, they wouldn’t know the difficulty of each process unless they experience it. I believe people would acquire solid technique through experiencing wide range of work. ーI see. I agree that their technique will highly improve through that process. Then, do you have any particular opinion about fabrics you use? Well, we always specially order fabrics and metal fittings. 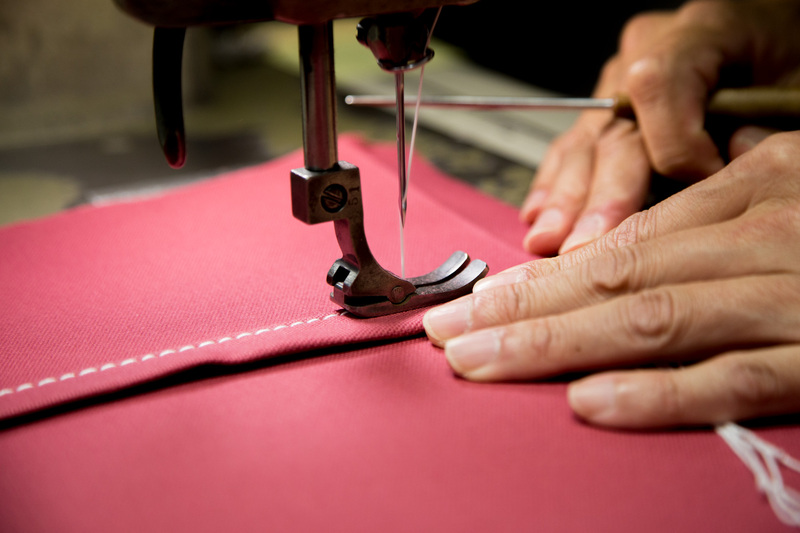 Some bags have our original zippers whose design was created by our workers, too. We mainly use canvas made of cotton and hemp. Both are natural materials. Naturally, they become much heavier on rainy days because of the humidity. On sunny days, on the other hand, they will be dried out. It is difficult to use them and stitch them if it is too dry. We have handled these kinds of troubles for ages, so we already fully understand how to use them by using our sensitivity. I can’t explain it well with words. I haven’t created “perfect bag” yet. ーIn your 32 years of working, did you make a product which you are completely satisfied? No. Although I think I could make some products quite well, I can’t say these are perfect. I’m not saying that quality of our product is bad, of course. Making something does not have the end. I think I can’t develop anymore if I consider I reach to the goal. As one artisan, I always seek a better product even when I create a good item. So I believe I still don’t get perfect yet. I think what he said is right. I haven’t get the perfect score, because I always look for the better work. If I was satisfied, my technique became poorer and poorer, and my work would be more irresponsible. So I try not to forget his word and my decision, and keep making products. ーWhat motivates you so much? Customers. I always work near customers, and I can directly see people who use my products. That’s because we make bags by ourselves, of course. If we don’t make them by ourselves, we never see people’s faces, and never know where the bags will go. So we make and sell them on our own. Our customers motivate me a lot. I want to make bags filled with people’s feeling. ーPlease tell us what you want to do in the future. I want to keep making good products until I get old, and I want to make customers happy by our products. 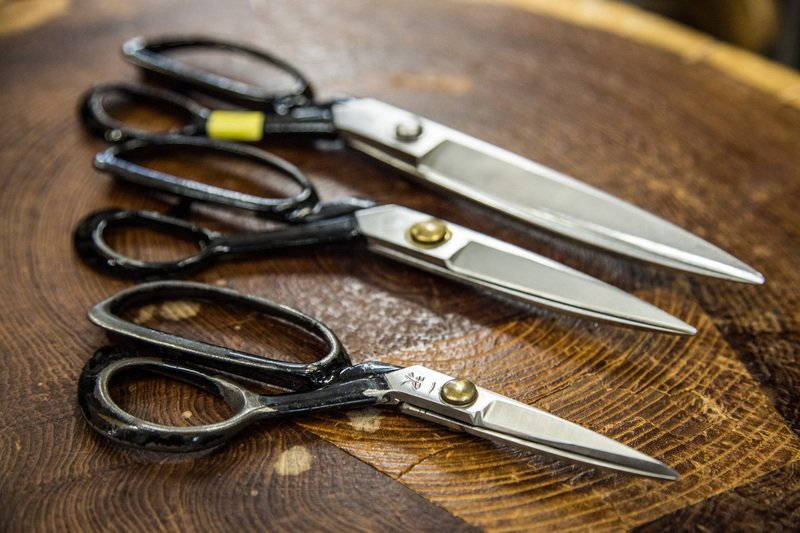 Recently, many people ask us to make special orders. So I want to make bags which meet people’s expectations, and at the same time, I want to create bags which are filled with people’s feeling, such as memento. Many of our bags were created by workers and customers themselves, by sincerely listening to customer’s request and talking together. We consider customers as “designers.” I want to keep realizing our designer’s requests by using our technique. He worked at a restaurant, dreaming of opening his own small restaurant someday. However, he damaged his health and started to work at Ichizawa Shinzaburo Hanpu. Started with making tents, he has made various products made of canvas so far. 32 years already passed, he still works as the manufacturing manager and train young workers at the same time. 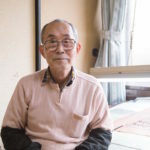 Ichizawa Shinzaburo Hanpu Co., Ltd. 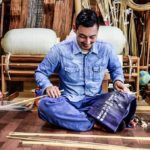 The origin of Ichizawa Shinzaburo Sanpu was bag making for particular job, such as milk delivery bag, alcohol holder, and carpenter’s tool kit bag. 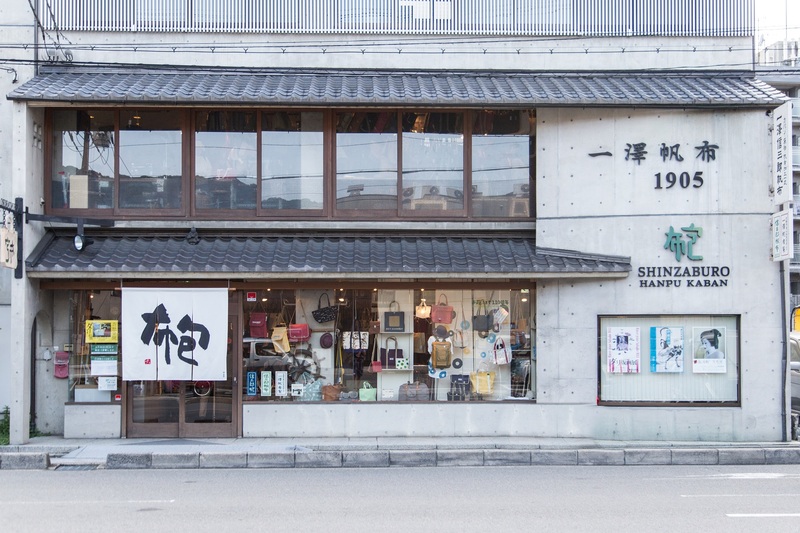 They started this business in Higashiyama area, Kyoto, in 1905. 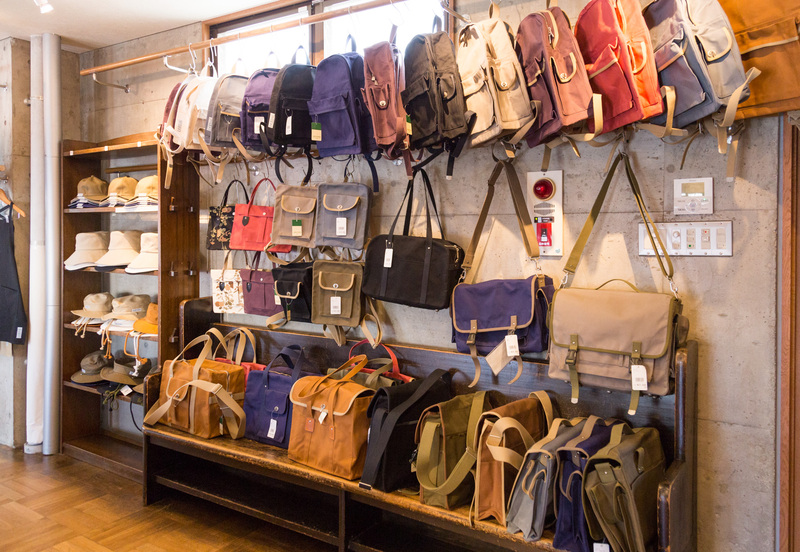 More than 110 years already passed, all of their bags are still handmade. These are our motto. The texture would gradually change as you use a bag for a long time. We hope you will enjoy the change and love our bags for a long time. 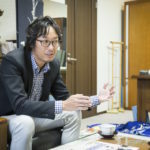 We interviewed Mr. Kitagawa at Ichizawa Shinzaburo Hanpu. 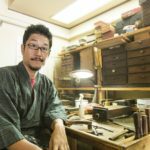 He talked about the sensitivity of craftspeople. As we thought, there are many things which can hardly be described with words, and I understood that it is not easy to teach these things to new workers. Also, we found their attitude of carefully choosing the material, and that thinking customers the first is great. We sincerely thank them for cooperating our interview project this time.